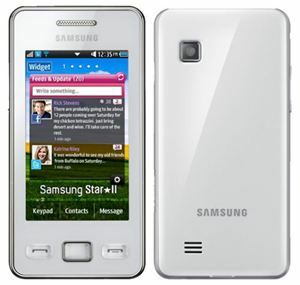 Samsung has finally announced the upgraded model of its popular Samsung Star phone with the named of Samsung Star II. The bar phone has been designed to target those users who look for social networking services while on the go. Therefore, the phone has been preloaded with several social networking applications such as Facebook, Twitter and multiple IM 2.0 for access to Yahoo Messenger, Gtalk and AIM. Featured with a 3-inch WQVGA touchscreen display which operates at 249 x 400 resolutions, the new model of Samsung Star is also equipped with a 3.2-megapixel camera for capturing still images. It boasts with TouchWiz UI 3.0, QuickType T9 Trace keyboard, 3.5mm headphone jack, supports Wi-Fi 802.11b/g/n connectivity and comes with a Li-ion 1000mAh battery. Moreover, it supports microSD card and Bluetooth enabled. The Samsung Star II is expected to be available in February in Germany and follow by other European countries, CIS (Commonwealth of Independent States), South America, India and the Middle East. However, the price of the bar phone is not yet announced.